Chris Wyse has been around the block more than once. 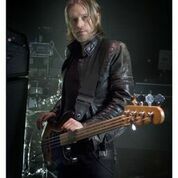 You may know him best as the bassist of The Cult who he has been with since 2006, until recently. He has since joined Ace Frehley’s band and will be on his upcoming tour after playing on Ace’s Space Invader release. He also has another band called Owl. Though Owl may not have been on everyone’s radar screen in the past (they’ve been together since 2007), expect to hear much more of the name going forward. Things You Can’t See is the band’s third and latest release. It is a very solid album and should help the band gain more fans and media attention. We recently caught up with Chris as he was preparing to play an Owl gig in New York City. Rock Show Critique: How would you describe Owl to those who are unfamiliar with the band? 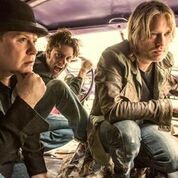 Chris Wyse: In a nutshell, a power trio that’s got a hard rock alternative sort of musically progressive edge and has a lot of hooks in the song writing craft. It’s a little different than a lot of other bands although we’ve probably been inspired by Zeppelin and Pink Floyd, Jimi Hendrix, Van Halen, Iron Maiden and Kiss. What we are about is kind of an alternative sound. I play the upright bass sometimes with distortion, utilizing a bow, delay and stuff like that. I would say it’s a pretty innovative kind of thing. The only way I got to express this kind of music was to create the band. It’s something I’ve worked on my whole life and that’s what is so interesting about it because I’ve done all these big bands. If you are just hearing about us for the first time that’s awesome and I’m really excited that people are digging our new stuff. This is our third release out July 28th. RSC: Tell us about your upcoming release Things You Can’t See? CW: Well I sort of put the stamp down on the first record and came up with a lot of the songs already. I knew the sound of the band I was shooting for. The second record we played around a little bit we did a cover of “Destroyer” by The Kinks. We did an Irish theme song that was about my trip to Ireland when I was a boy. The third record is definitely more on a dark mystical. Maybe what we do best is really nasty, spooky kind of songs that you can sink your teeth into. They really have hooks just like any great songs would. I think we’ve come together to create something a little bigger than we anticipated. All this exciting explosive stuff would happen in the studio in jam sessions. We are just so delighted at the way this came out. Very in the moment but we honed it in and I produced it again. I think we just got much better over the years and we’re honed in. “Who’s Gonna Save You” has a lot going on in a small amount of time and a lot of musical energy. It’s really got all the musical bells and whistles but you can also play it on an acoustic guitar. I just think it’s all coming together more than ever. I’m really proud of this one. RSC: How did you land the gig playing with Ace Frehley? CW: Well Johnny Temptesta from The Cult and I toured the world together, sat on the tour bus night after night and talked about everything. He’s like a brother so he knew I was a big Kiss fan. He heard through the director of a DVD he (Ace) was shooting about his guitar playing, An up close and personal kind of thing. Basically he needed a bass player for the day because he had all these guests from other bands. Matt Sorum, Tommy from Ozzy, Scott Coogan was there John 5 from Manson, Zombie, George Lynch and people were going in and out all day but I was the only bass player which was really cool. So Johnny kind of suggested me and I got the call to go do it. Ace and I hit it off really well. There was a super cool vibe, amazing full sound we had together right out of the gate. There was a genuine thing there too that lead up to me taking advantage of time with Ace while The Cult were on hiatus. It just developed and Ace and I hit it off so well. What happened was with the Cult and everything going on in my life was so busy I had to make a decision to go on board and take Ace’s offer. It’s doubtful at this point and time I would allow anyone in my position. It definitely is about working with Ace’s schedule. He’s really cool and its awesome that he keeps us posted on press releases and I’m aboard on with him on his wall and it promotes Owl. He gives me a bass solo every night and I sing lead vocals on “Strange Ways” that used to be sung by Peter Criss. I sing harmony all night. We got Scotty Coogan and Richie Scarlet in the band, tremendous musicians. I’m just really blessed I have these two bands because If I didn’t do this and Owl no one would really know what I do. Slowly but surely we are getting more press and attention just because we do it for the right reasons, we’re a real band, not a project. RSC: You’ve played with The Cult since 2006 and played a lot of festivals. Is there a difference between playing large festivals as opposed to clubs that hold a couple hundred? CW: I don’t think so. There’s really no difference. I tell everybody this all the time especially young musician’s and they ask me all kinds of questions about that. The thing is your track is always the same get ready for the show. You check your cables, your cords, your batteries, your tuning, your backup guitar, backup bass. I check my bows, my backup bow and my rosin. I’ve done 150,000 on Canada day when I was with Tal Bachman playing “She’s So High” and it was also televised and that must have been like 99’, many years ago. I can tell you it felt like playing to nobody because the distance from the barrier was so far away. The screens were so huge, it was such a sprawl of people across the Capital of Canada. It was such a big hit and such an honor. The experience I’m gonna have tonight with Owl is probably gonna be really sweaty and some of my sweat and rosin from my bow might get tossed down your suit jacket or dress (laughing). The best way to treat every show is like its just always the same. You don’t want to get too high or too low about it. It’s about your performance isn’t it? You know what I mean? I think its a mistake for artists to go out there and be like “hey you guys get into it”. The artist has to bring it too. Big show, small show I try my best. I just hate it when people are so far away. I try and connect every single time. RSC: Instead of asking you about your influences, give us a few bass players you recently started to appreciate. CW: Well that’s an interesting question. I think the cat in Vintage Trouble is really good and he really holds it down well. That’s a newer band that’s been doing great. I know Nalle the guitar player and he would be in bands that would get hired to be in session work and so on. Back in my earlier Hollywood days I would see Nalle around. So that’s a fine band to get out there and play cause its real rock n’ roll stuff. I really dig that. RSC: What are your plans for the rest of 2015? CW: Well its filling in and its filing in nicely with Owl. We are going to be teaming up with Dave Lombardo’s band PHILM. We already have a couple of shows. We are about to announce some more shows. It’s really cool to team up with someone like Dave Lombardo. It’s an amazing band as they are a trio as well. Both bands are very musical. I think its a great team of artistic musicians who are doing it for the right reasons and trying to create cool bands first and not let the labels tell them what to do. The resources I have and the people I’m working with are just tremendous. To have Ace Frehley calling me for his bass player and asking me to join his band. It’s been all just a huge honor, an amazing time in my life. Special thanks to Renee Harrison for setting us up with the exclusive interview with Chris.